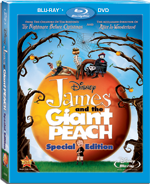 James and the Giant Peach, Henry Selick’s stop-motion follow-up to The Nightmare Before Christmas, isn’t as flashy as its predecessor, but it doesn’t need monsters or fantastical sets to tell a good story. The Blu-Ray release has one new bonus feature, in addition to the extras from an earlier DVD release, none of which are selling points. James is worth checking out for the movie alone. Actually, James and the Giant Peach does have monsters. In the live-action sequence that starts the film, young James (Paul Terry) has been orphaned and is placed in the care of his perfectly dreadful aunts, Spiker and Sponge (Joanna Lumley and Miriam Margoyles). James spends his day toiling until a mysterious adult gives him a bag of magic green ... somethings. They get spilled of course and suddenly a ginormous peach grows from a mostly-dead tree. James escapes into the stone to find it populated by an assortment of large bugs with colorful personalities. The new friends embark on a grand adventure that takes them across the Atlantic Ocean to New York City and, they hope, a better life. Along the way are family-friendly messages about friendship and facing one’s fears. James benefits from having less-ambitious visuals than Nightmare (but do look for the Jack Skellington cameo). Without the elaborate sets and backgrounds, Selick is freer to concentrate on the colorful insect characters without losing the wow-factor of stop-motion animation. The Blu-Ray edition comes in a two-disc combo pack which includes a standard DVD of the movie. The only new feature on the Blu-Ray is “Spike the Aunts,” a game in which the player tries to poke those nasty aunts with a rhinocerous. The other bonus features are also on the standard DVD. These include a five-minute production featurette, that was made to promote the film’s theatrical release. There is also a music video of Good News, the Randy Newman song that plays over the end credits, and the original theatrical trailer. The most interesting bonus is an extensive gallery of production stills. Unfortunately, the images are quite small compared to the size of the screen. The Blu-Ray also has a segment on how to use DisneyFile, a bonus disc used for copying the movie to media players, even though no bonus disc was included in this set. The movie is presented in its original 1.66:1 aspect ratio. The movie was shot in this aspect ratio, but was originally released in theaters with a 1.85:1 aspect ratio. Only the 1.66:1 aspect ratio version is available on home video (in North America, anyway). The digital restoration is clear and crisp on both the Blu-Ray and Standard DVD. The older bonus features are not high-definition and don’t look as good. The sound, which is HD-DTS, is equally crisp. The standard DVD has Dolby Digital 5.1 surround. Both the Blu-Ray and standard DVD have optional French and Spanish audio and subtitles. They also have captions in English for the hearing-impaired. After watching the movie, check out the stills gallery. There isn’t much to “Spike the Aunts,” but it’s good for a couple of minutes of entertainment.